Where is the joy of cooking? Part of it comes from simply making a meal. Whether you are puzzling together ingredients, hacking around in the kitchen with good friends, or playing with the peas on your place, construction is fun. Besides, the kitchen can be the most intensely interactive and sensory rich place in the home. Full of warmth and anticipation, it is the hub of family life. Another part of the joy obviously comes from just eating. Few truisms are truer: you are what you eat. And we all love to eat. But what do you eat, really? Most people have hardly a clue. A rare person actually understands nutrition labels. Very few people have any quantitative sense of their diet. Socially things are not much better. Even though the kitchen can be a wonderful nexus, family dynamics have changed considerably. In the 1950's, the average family spent more than an hour a day gathering, cooking, serving, eating, talking, and bickering over food. Today, the figure is 16 minutes. Table talk, once a cornerstone of family life, seems to be a casualty of fast food. Think back on 100 years of developments in the kitchen: electricity, gas, microwaves, freon, teflon, disposals, dishwashers and detergents, frozen foods. Don't forget recent media: newspapers often pile up in the kitchen, and most families keep a telephone there, and frequently a TV, too. Now imagine: what innovations might come in the next hundred years? Given the potential pervasiveness of computers, networks, and the like, what place will digital media find in the kitchen, and how will it affect lifestyles? Will kitchens help us eat smarter? Will there still be joy left in cooking, or will we be confronted with Windows00 in the microwave? One thing is clear. The kitchen is no place for a keyboard, and it certainly is no place for a mouse. In fact, considering the fundamental importance of kitchens, today's conventional computer designs really will not cut it. They barely work in offices, and are inapplicable to kitchen life. In fact they run completely counter to what is required. What is required really is "counter intelligence," in every literal and figurative sense. An intelligent countertop might sense ingredients, watch your simmering pots, covertly count the calories, or coach you towards mastering the art of French cooking. The counter is by no means the only focus. Digital channels will surely ripple through appliances, utensils, cabinetry. In time perhaps they will be woven into table linens. Whatever the future possibilities, the best way to predict them is to invent them. For a place so vital to a healthy, happy, sociable life as a kitchen, a dramatically different approach with technology is needed. That is what we propose to explore. The MIT Media Lab is initiating a special five-year research program to invent future kitchen and domestic technologies. Membership will be composed of appliance and utensil makers, food makers, retailers, technology companies, and others who make products with a strong bearing on kitchen and domestic life. Initial faculty include Professors Judith Donath, Michael Hawley, Nicholas Negroponte, and Seymour Papert. Our Lab loves food. In fact, visitors to the Media Lab often remark on how astonishingly good the food and wine are here. They are also usually intrigued with the vast and eclectic array of research: Nearly $30m/yin research volume, driven by 400 full time researchers and 180 corporate sponsors, keeps the place constantly bubbling. The Lab's three major consortia - News in the Future (NiF), Things That Think (TTT), and Digital Life (DL) - provide an extraordinarily fertile foundation for more applied research. Like our other special research programs (in Toys, Cars, Tags, etc) all members of Counter Intelligence will have access to Lab-wide intellectual property and will become members of one major consortium. Existing Lab sponsors may additionally join Counter Intelligence with a small increment to their existing sponsorship. It may be a delight, but not a surprise, to learn that the Media Lab's first gala event twelve years ago was fed by a caterer from Connecticut. Coming full circle, that same caterer, Martha Stewart, is now helping to kick off Counter Intelligence by challenging inventors of digital media to lend a hand in the kitchen. This style of research, bravely colliding the most advanced technologies in the world with fundamental artifacts and aspects of daily life, is the bread and butter of invention at the Media Lab. Where else would you find edible electronics and laser-carved bagels? No other research laboratory invites such a unique mix. Kitchens are inherently full of surprises. Pasta has a habit of boiling over, and the guests who arrive early frequently roll up their sleeves and join the melee in the kitchen. We expect the unexpected from research in Counter Intelligence. Following are a few starters. People love their CuisinArts, KitchenAids, and rice cookers. But what might a food processor do if it actually contained a food microprocessor? When and how might the biology and chemistry of flavors and odors be harnessed by digital technologies to add to a food synthesizer? Could a spice rack compute an unorthodox mix of spices that combine to make your meal taste authentically Bhutanese if you are contemplating a vacation there? Designers playfully refer to creative assembly of food as "snackitecture." But why should a cookie cutter be a bent piece of tin, when it could just as easily be laser cut (and ink-jet iced) in remarkable shapes? The toaster could print horoscopes on bagels. A pasta maker might take CAD specs as input. Should there be a "PostScript" for pasta? Instead of a bread machine, a cookie machine might make animal crackers or vegetable chips cut in the shape of the cartoons on television, or make fresh alphabet cereal for breakfast, to help a child's reading lessons. We propose to invent new, creative, digitally-controlled things for making food. Assume (and invent) a totally networked kitchen. A prerequisite is a sane standard for controlling kitchen appliances, which should be of great interest in the white goods industry. Even a routine "toll free" warranty call on a dishwasher costs the manufacturer about $50 to service, so an appliance that could signal a faulty part, or coach a user along (even if simply by connection to a user group or "frequently asked question" pool) would have great cost benefits. But ingredients, pots, pans, utensils, and appliances could be full of sensors and links as well. Your oven mitt might measure temperature. A soupspoon might make a nutritional analysis. A camera could watch the pot on the stove. A smoke detector could include a much more sophisticated electronic nose. With our other efforts in networked infrastructure (through Toys of Tomorrow, and Things That Think) we are well positioned to develop standards for home networking, and to explore their creative limits. People are extraordinarily naive about what they eat, how it is metabolized, and what goes out. Most are horrified by ideas like tableware that counts calories, bathroom scales that graph your weight over the last year, or toilets that do medical analysis. Yet without transparent diagnostics, we will never gain really valuable quantitative understanding into the interplay of health and food. Instead of a fad diet, or the approach of frightening you with a picture of your caloric trends, the kitchen might make a more constructive suggestion. Knowing your body's intake (in itself, a real challenge), your cupboard contents, and a few other constraints (perhaps the movie you'd like to see), the kitchen might propose a healthier menu, something you could make quickly from the contents at hand. It might entice you to mix the ingredients yourself, thus helping you learn through touch and through construction what constitutes a healthier diet. We need to invent technologies to quantitatively and passively track intake in order to enable a number of new applications. The kitchen was the social center of the home, the place where friends and family gathered. Sharing a meal is a timeless way to mark celebrations, cement new relationships, and maintain family and community ties. Yet much has changed. Instead of extended families sharing a bustling kitchen, modern families are often extended geographically, scattered around the globe. The great village kitchen, always open to passersby, has been replaced by an efficiency kitchenette, with a freezer full of frozen food. What can technology do to revitalize the kitchen as the social center? Video links can bring distant family members to the table. We can transmit a sense of the bustle, the sounds and perhaps the smells of mom's kitchen. We will design a kitchen net that is again the hub of extended family life. 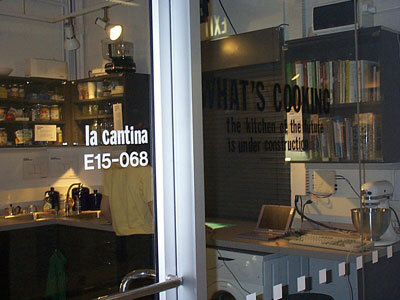 Visit Counter Intelligence at work in 'la cantina', located in room E15-068 of the Media Lab. Project Coordinator Kristin Hall can be contacted at 617.253.0467 by phone and at kristin@media.mit.edu by email.